Check regularly and check often is a good motto for your rabbit's reproductive health. Testicle problems often progress rapidly and require immediate medical treatment. Take a look at your rabbit's groin frequently to catch problems before they become serious. His testicles should be pink, oval-shaped and evenly matched. An abscess is, in short, an infected wound. A cut on your rabbit's testicles can quickly turn into an abscess. An abscess usually forms when rabbits fight and one bites the other in this sensitive area, but it can also be caused by a loose cage wire, unsafe toy or even sharp pieces of hay. The testicle will appear swollen and red and may be hot and firm to the touch. Your rabbit may also stop eating and act lethargic, although some rabbits don't show any symptoms other than a swollen testicle. Veterinary treatment is necessary and often includes antibiotics and draining the abscess. Vent disease is known as rabbit syphilis. Formally, it is called Treponematosis and is caused by a bacteria that is spread through sexual contact. It affects the entire genital region, but may appear as small blisters or sores on the testicles. Eventually these sores become covered in thick scabs. Vent disease is treated with Penicillin injections. Examine your rabbit before breeding or allowing any type of physical contact with another rabbit to prevent vent disease from spreading. Red, raw skin on a rabbit's testicles is often a sign of hutch burn. The testicle itself is not normally swollen or infected, but the skin covering it is. This is caused by too much contact with urine and is often the sign of a dirty cage. It can also be caused by urine splashing back on to the rabbit's genital area when he sprays a solid surface. Hutch burn is treated by cleaning and applying ointment to the affected skin. Keep the cage and your rabbit's genital area clean to prevent recurrences. Like all mammals, rabbits can get testicular cancer. Although there may be other symptoms such as weight loss and decreased appetite, one of the first signs many owners notice is a swollen or enlarged testicle. The testicle will probably be removed as part of the treatment, but if it isn't caught early the cancer can spread to other parts of the rabbit's body. Pasteurellosis is a bacterial infection that can cause a rabbit's testicles to become filled with puss. This infection can also affect other parts of the body, including the respiratory tract. 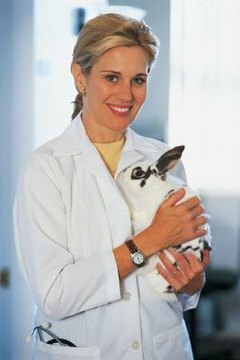 Antibiotics are used to treat bacterial infections, but often fail to rid the rabbit's body of the infection completely. He may go into remission but show signs of the infection again at a later time. Pasteurellosis that affects the testicles is spread through contact with mucous membranes. It can be spread between rabbits during breeding or a male rabbit with a respiratory tract infection can spread it to his own reproductive tract during grooming. Sample testing by a veterinarian is used to verify a pasteurellosis infection. This type of bacterial infection is highly contagious and is prevented by keeping infected rabbits permanently away from healthy ones, even when symptoms disappear.